When bioethanol bio ethanol is in contact with hot surfaces, it vapourises quickly. Ethanol vapours; which are heavier than air, have a tendency to remain within the confines of the fireplace. when igniting the liquid in the burner, vapours will also be ignited creating a hot start ignition effect. If there is a high concentration of vapours, ignition becomes dangerous and several accidents have occured with non secure burners. Our electronic burners are equipped with temperature sensors and locking systems controlled by an electronic microprocessor. The D35-386 standard requires a high combustion index to limit the amount of CO and volatile organic compounds released. This basically translated means that the CO levels should remain below a certain low level during the combustion process. Because the electronic burners constantly pumps ethanol into the burner, the liquid height in the burner remains relatively constant throughout the whole time the fire is burning. As a consequence the amount of oxygen getting to the burner is the same throughout the whole burn. This can be compared with the "Kleenex" box type metal burners, where as the liquid level within the burner drops as the liquid is consumed. This leads to an increasing distance for the oxygen to travel to meet the flame and therefore the combustion process is not as clean as when the liquid level is high. 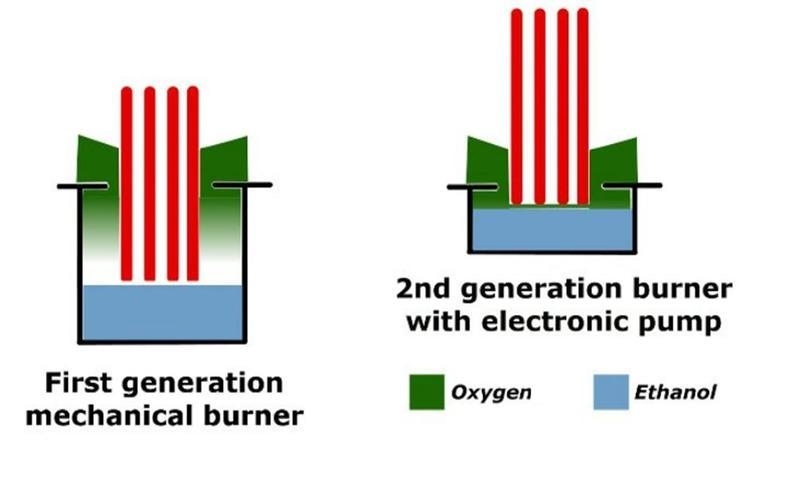 The falling liquid level in the "Kleenex" box burners (diagramatically indicated on the left) makes it harder for the oxygen to get to the flame. This can be compared with the electronic burner on the right where the liquid level is constant and the oxygen levels are constant. The result is a cleaner more consistent burn from the electronic burners. Caution has to be exercised when refueling bioethanol burners becuase ethanol is volatile. When refilling takes palce directly in the burner, it can be difficult to ensure that the burner does not overflow. Spilled bioethanol needs to be cleaned up before the fire is lit. Using a removable fuel tank ensures that bioethanol is not spilled and that all refilling is done away from the burner; ideally near a sink; ensuring a safe filling process. Even though the electronic burners have been tested for their natural combustion quality, they still incorporate a built in CO2 detector. This CO2 detector activates an emergency shutdown in case of oxygen depletion. Why do we need it? The main ethanol combustion products are H2O and CO2 (carbon dioxide - normal product of exhaling). It can produce CO(carbon monoxide) which is odourless, colourless and dangerous when in burns with insufficient oxygen. This poor combustion can be due to poor burner design or inadequate airflow. Where the potential for inadequte oxygen for proper combustion is apparent; e.g small confined room; the installation of an quality device monitoring device is essential. At the moment CO2 detectors have been found to be more reliable over time than CO detectors, for this reason CO2 detectors are used on bioethanol fires. Anticipate oxygen depletion in the room by continual CO2 monitoring. Shut the appliance down if and when the CO2 reaches levels of 0.8%. The removable battery holder provides the user with a simple and efficient way of preventing unwanted use by others such as children, guests, teenagers or guests. In December 2008, CCS, Commission for Consumers Security, (an independent french public authority which includes consumer groups, industry experts & professional organizations) published a very strong warning against a majority of ethanol fireplaces on the market, specifically addressing the models with “ Kleenex box type” burners. This commission recommended a list of security measures necessary for public safety including a CO2 detector and anti-flash features. Significantly, the CCS called for a specific Standard regulating the ethanol burners industry . Since the government's announcement, AFNOR published in August 2009 , the French Standard D 35-386 “ Ethanol Fire Appliances Safety Requirements & Test Methods”. 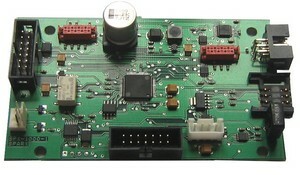 SPARXS burners original design and manufacture pioneered in their compliance of these requirements. In june 2010, the norm has been made compulsory for public places. In case of an accident in a private place with a non-conformed fireplace, based on the CSC's recommendations and the government's issuance, insurance companies may be within their rights to deny coverage, thus increasing the liability of industry distributors or manufacturers.